What to expect in there & modifications to improve reliability. The high cam 175 has two cam drive configurations, combination chain & gear & gear alone. The combination drive uses helical cut drive gears from crank to idler pinion where a combination gear/chainwheel transfers the drive to a rollerless single row cam chain. This chain has two variations of tensioning mechanism. The earliest being a truly hopeless spring steel strip arrangement, the later system is a spring loaded twin sided slipper which is marginally better in that it is more robustly made but still suffers from breakage of the conical tensioning springs. (the remnants of which usually end up being chewed up by the drive gears or ruining the fibre oil pump gear) This later version was supplied as a replacement for the early type & is indeed worth fitting to any engine still using the early version. When either type of tensioner fails the damage to the crankcase & timing cover can be very severe. At the least alloy filings will be ground away from the cases, at worst the timing cover will be holed where the chain hits the mounting screw bosses. 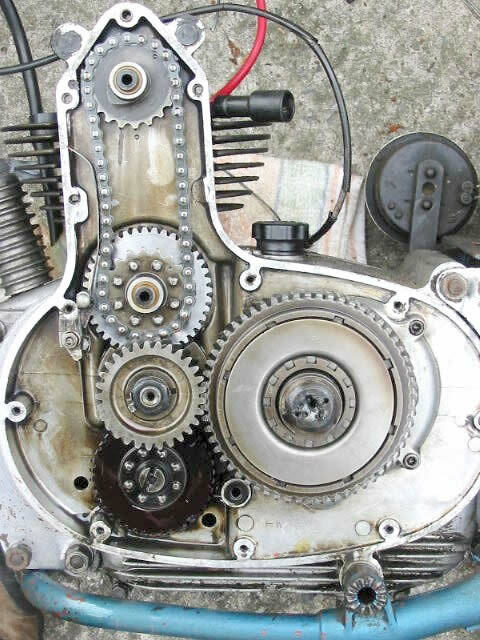 Damage caused to a timing cover by a tensioner (early type) failure. The damage can be repaired by skilful welding – the alloy is very thin & distortion can be a problem – or the employment of an engineering grade epoxy repair system such as Devcon alloy paste. This can be machined when set and is a good alternative to welding. 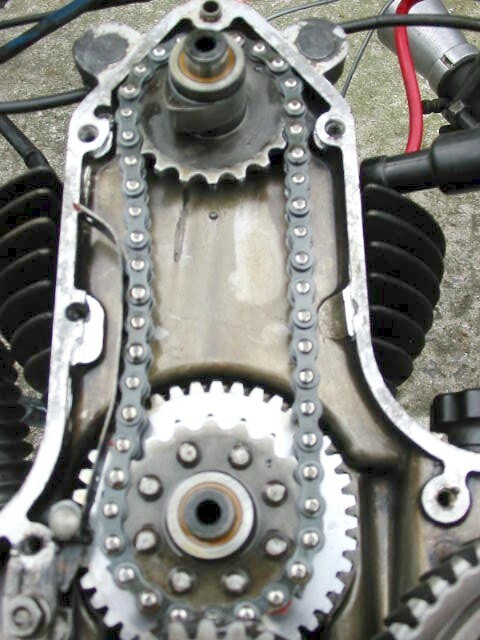 Below – Chain drive with early tensioner (broken…big surprise there then). To the left we have the later type tensioner. Note that it is fixed by a single bolt which utilises a boss cast into the crankcase originally used for a spindle in the gear drive version. The two holes above the nut are for fixing the tensioner as a replacement for the strip steel type in an early engine which would not have the gear drive boss. Note the broken spring in the right side tensioner. 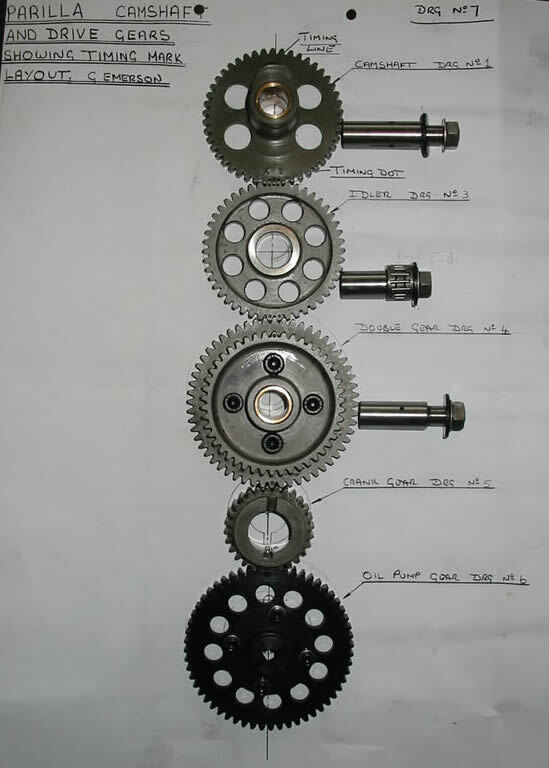 Gear drive system – note all steel straight cut gears. The improvements made by Parilla to the early tensioner were at best marginal & poorly thought out. There is no point in tensioning a chain on the drive & “slack” side. Other manufacturers with chain drive cams rely on a single sided tensioner on the return side of the chain run. Tensioning a chain with a spring is OK as long as there is a mechanism to take the load off the spring once the slack has been taken up- some Japanese engines use spring tensioners but they have a locking system to keep the slipper in contact with the chain & relieve the spring of the cyclic loading & unloading. Other manufacturers, such as Norton, use a slipper which is tensioned by hand & locked in position as the engine is built. Both types have a good track record (when maintained) so I’m of the opinion that the Parilla tensioner can be further improved. My next engine will have a prototype single sided “rigid” tensioner. The other cam drive system is, to my mind, the perfect solution. Parilla themselves utilised this method in their works & production racers. There are no tensioners to worry about or chains to thrash about plus the system uses no fibre gears (I didn’t mention those yet) in the timing or oil pump/points drive. A more expensive solution in its day & no less so today. The 175cc chain drive engines can be converted to gear drive, indeed Parilla offered just such a conversion for the engines. Even the very early type with no cast in bosses for the idler gear. The gear drive system uses straight cut gears from the oil pump/points gear, crank pinion, 2 piece conversion gear, idler & cam. The primary drive is also by straight cut gear (not shown in this picture). I have a gear drive 175 & can vouch for the reliability of the system. Gear drive conversions are available today for both 175 & 250 engines. All gears, bearings, X1 cam & spindles in the drive chain are included, only the primary drive remains as a helical drive (in the case of the 175 engine). Supplies of these conversions are limited & inevitably expensive, see Parts-Engine for availability & current prices. 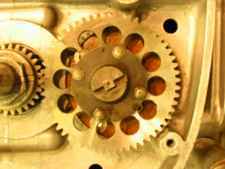 Mention was made earlier of the usage of fibre as a material for some gears in the cam drive of the “chain” engines. To my knowledge, none of the gear drive units use any fibre cogs at all. No doubt the use of fibre ( a composite of a fabric lattice with a resin binder) was an economical & suitable material for low stressed drives such as points/oil pump. Easy to machine & silent in operation, it would have been ideal but for two disadvantages, one was predictable the other less so. The predictable was that straight cut gears, with little side restraint, would move about. In the case of the steel gears, this might have led to a few witness marks, for the fibre ones it meant great lumps being machined away by the harder material. In some cases teeth were sheared off or weakened to the point that failure would occur some time later. The less predictable was that the drive – a steel hub with a fibre outer section – was inadequately fastened together in the longer term. The two materials were riveted together using at first 4 (later 8) rivets. These held until the rivets fretted away the fibre; the gear wobbled on the hub & machined itself away on the steel driver or just fell off. 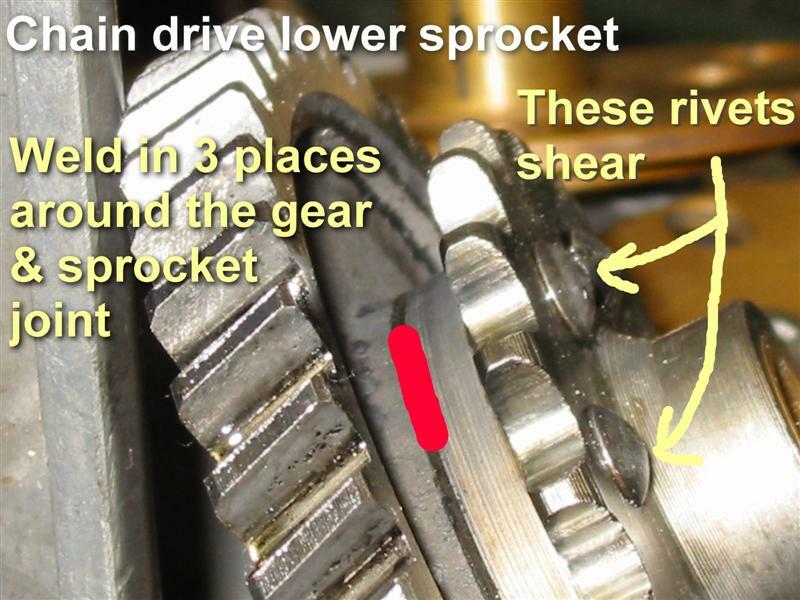 In the case of an engine with a left side points drive (combined with the oil pump) failure of this gear also killed the ignition. An engine with dynamo side points or a modern crank mounted CDI, would seize. Once again steel replacements are available for the oil pump gear, see Parts – Engine for availability. Both straight cut & helical types are in use. While we are in the area of the oil pump its worth mentioning that the output was increased as the engine grew in capacity. 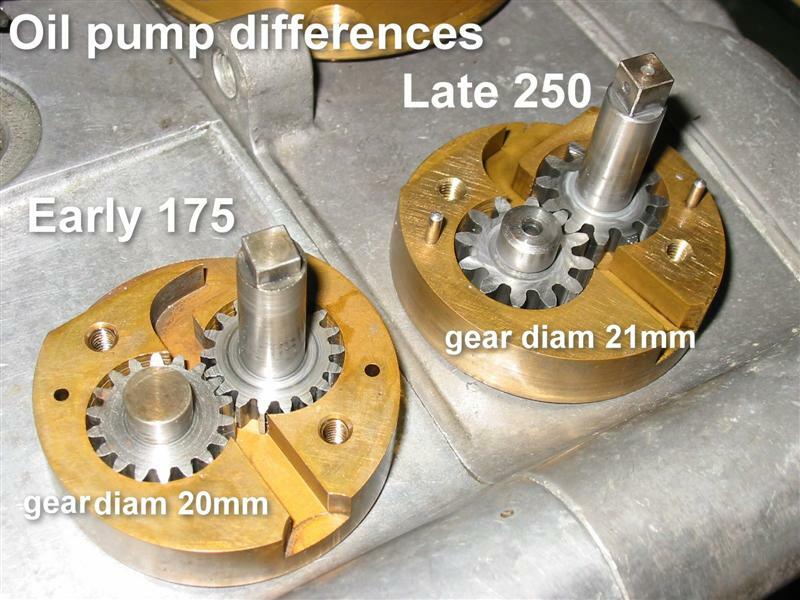 The picture (left) shows a pump from a ’54 175 engine & one from a 700 series 250. As well as being a larger diameter gear in the later pump there are fewer teeth with greater volume between them to increase the output even further. With the exception of the different end to the driven gear both pumps are identical from the outside & are interchangeable. Quite a good modification to an early engine, more oil is rarely a disadvantage with these engines particularly if one is providing rocker lubrication to an engine which was originally fitted with none. A common failing in the chain drive engines. That’s about it in the timing case…..except for the rare chain engines with a fibre gear on the lower cam chain sprocket as well as the oil pump/points drive …… the fact that the timing chain has no rollers & because of that the side plates can float in & seize the drive up…….the helical primary drive gears on the 175 engines that load up the crank laterally……..the weak clutch spring arrangement …who said it would be easy !! !